As you know, I am not a fan of subwoofers—that is, I wasn’t a fan of subs until I ran headlong into JL Audio’s e110 about a year ago, and concluded (to my astonishment) that when this compact, affordable sub was paired with a superb two-way like the $27k Raidho D-1, it came so close to the sound of my $200k reference loudspeakers—at one-sixth their price—I could scarcely tell the difference. Maybe you'll get a change to listed to some subs at AXPONA. Most rooms won't have them but some will. Why, you may ask … Just like life is better with the dog. Life is better with two subwoofers! Dog! For sure! You da man! What pre did you get? Speaker level is the only way to go, IME. REL and Velodyne have been telling people that for years and it only makes sense that one would want the sonic signature going to their speakers to also go to their sub(s) too. Checking out them SS 9.5's? I have the SB 16 Ultra. It is a beast and I’m very happy with it. Those are beautiful! Plus they have an open back Audio Technology midrange. DAMN! I think its a matter of time before Salk will start offering curved tops, sides. The above would be killer with a curved top. There's lots on innovation going on at Salk Sound! It depends on where it was Imported from! Definitely dialed-in...the floor was vibrating like those dinosaurs were in the house! Verb this is a subject that I am very familiar with. To answer your question directly? If you only want the sub for music? Get sealed. I have heard most all of the big boys, major players, owned a few or heard them in my rig, blah, blah, blah. My favorites for movies has always been slightly more toward ported with the one exception of the custom Godzilla sub Trey built that even Russ couldn't hold down at Trey's place. That sub and Russ must have weighed in at 300 pounds and even with Russ on it, it still moved across the floor with ease. My ONLY choice for music is sealed and Direct Servo. Before getting my two Rhythmik F-25's, my favorite sub was the VMPS Larger with upgrades that I had gotten from Trey many years back. Paired with a Velodyne SMS-1 and a Carver M1.0t (possibly a MKII, I can't recall now), that sub was amazing and the best I had never heard in any system. Yes, I said that right. 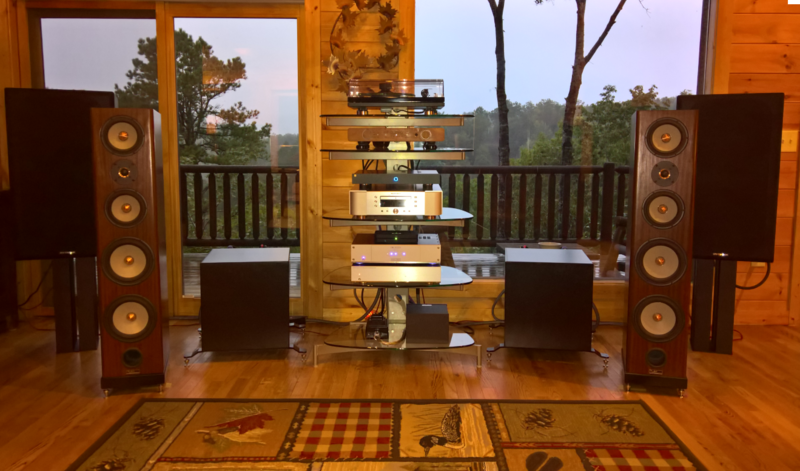 Even Bob Carver himself made the comment more than a couple of times at Carverfest one year where this particular system was featured. In fact, the number one comment on the system that year was how well the sub blended into the system. You simply could not hear it at low volume or high volume. Now when you cut it off, the entire system lost an incredible amount of its allure, air, spatial locational cues, etc....not to mention the lowest spectrum of the frequency curve. This was the rig that was featured at Carverfest that year. Apparently the link disappeared o the other thread. I emphatically recommend a direct servo sub, sealed for music. It doesn't so much matter the brand, just that it has direct Servo and it is sealed. To date, I still have not heard a finer set of subs anywhere. FWIW. For your application, it is perfect. The Jurassic World scene was outstanding! Apprecitate your comments and insight @treitz3 ! Tom I've been researching the Rythmik's a lot over the past few days. Hmmm, this *may* prove to be an interesting discussion. I have heard this from folks at Polk, sub manufacturers as well as other folks in the industry. Now on the flipside, I have heard the exact opposite from the same folks, albeit different folks. Here is my philosophy. If you have invested a considerable amount of time, research and dollars on getting your rig to perform to its optimum potential, then you add a sub.....why would you want to add another component into the chain that can/will/has the potential to lose all of the aspects of what you have been trying to achieve? I understand that "they" say that it "just passes through with no signal loss".......uh-huh. When have any of us actually believed that? I damned sure do not. Everything affects everything. With that said, on a HT system? Eh, going through the sub on speaker level would most likely yield better results. I will concede to that....up to a certain performance level. With a dedicated 2 channel system that has been painstakingly put together? I will have to agree to disagree. Experience tells me otherwise. You're thinking that using speaker level means connecting speaker cables from the amp to the sub, then from the sub to the speakers. While that is a possibility, albeit with very few subs, the more common method is connecting speaker cables from the amp to the speakers and another set of speaker cables from the amp to the sub. 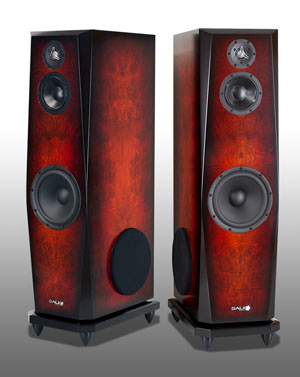 Therefore, the speakers and sub receive the exact same signal at the exact same time and the exact same sonic signature. Win-win!!! Yes, that means the speakers are being driven full range, but so what you're driving them with an amp or integrated not some wimpy AVR, so you don't need to worry about over-taxing the power supply. Ah, in that case it would be a win-win. Agreed. That's a little hard to do with our fancy cables and Nanner's though. Need to go back to old school to do that, unless the amp has two binding posts for speaker out. Nah, it's easy to do with one set of binding posts. Use bananas for one set of cables and spades for the other. What kind of load do the high level (i.e., speaker level) inputs on a powered subwoofer put on the power amplifier outputs? I was thinking the same thing, what does that do to the signal going to your mains? Must change or affect it in some way. Nothing, the impedance is so high the amp has no idea the sub is there. Thanks F1. Never thought to try that configuration when I had my Hsu. That was 90% HT though , so I used LFE only. I'll give this a try when I get a (smaller) replacement to be used with full rangers for 80% music. My sub is receiving the signal from speaker cables connected with bare wire at the posts on the integrated while the speakers are connected with BFA banana plugs on the speaker cables to the posts. Sounds good to me and I haven't measured / blended with REW yet. I've been working with JL subwoofer for a very long time and every single time I put one in a system, calibrate it and sit down and listen I smile with joy and still surprise. I'm always waiting to find something I don't like about their sub's. Musically and Home theater they don't care, they do both duties as well as the other which is a tall order for most subs on the market I've calibrated. Hmmm; I never realized that adding a bit more bottom end could be so difficult. In my case I added a single 18'' transmission line sub in a corner. I have it set on it's lowest crossover point and using the line level input I barely have it at 1/8 volume. It blends in nicely with my 1.2tl's and is noticeable only when it's turned off. I'm guessing it must be more difficult getting things right with book shelf speakers that don't go that deep? the more common method is connecting speaker cables from the amp to the speakers and another set of speaker cables from the amp to the sub. Therefore, the speakers and sub receive the exact same signal at the exact same time and the exact same sonic signature. Win-win!!! This is exactly what I was planning to do. My amp has 2 sets of outputs, one XLR and one RCA. I’m using MIT shotguns to the main speakers right now. My question is, do I need an equivalent high-quality XLR cable for the Rythmik sub? Or use any standard “subwoof cable”?